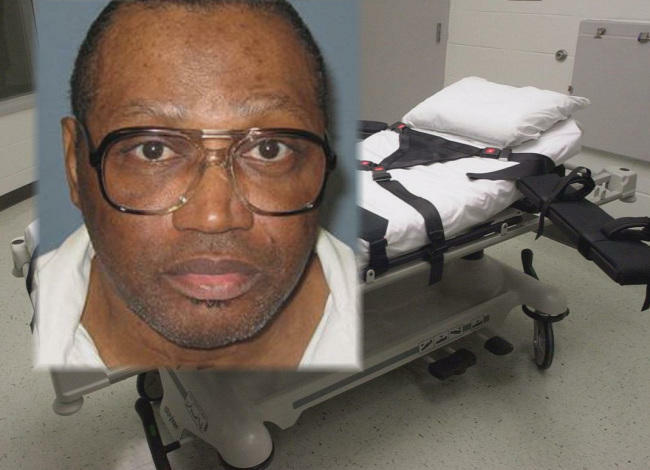 WASHINGTON -- The Supreme Court has agreed to hear the case of a man sentenced to death for killing an Alabama police officer but who lawyers say now can't remember the 1985 murder. The court agreed Monday to hear arguments in the case of Vernon Madison. Madison had been scheduled to be executed in January, but the court stayed the execution to consider whether to take the case. Madison's case will now likely be argued in the fall, and the court's decision to take the case means he is safe from execution at least until the case is decided. Madison's attorneys argue that strokes and dementia have left Madison unable to understand his execution or remember killing Mobile police Officer Julius Schulte, who had responded to a domestic disturbance call involving Madison. They argue executing someone in such a poor mental condition will violate the ban on cruel and unusual punishment. The Supreme Court has previously ruled that condemned inmates must have a "rational understanding" that they are about to be executed and why. But the same court ruled in November that Madison's execution could proceed. Justices said then in an unsigned opinion that testimony shows Madison "recognizes that he will be put to death as punishment for the murder he was found to have committed," even if he doesn't remember the killing itself. The state attorney general's office said courts have found that Madison, though in declining health, is competent. Schulte, a 22-year veteran of the police force, had responded to a report of a missing child placed by Madison's then-girlfriend. Prosecutors said Madison crept up and shot Schulte in the back of the head as he sat in his police car.